Now 32 year old, experienced, Cameroon’s Sarah Hanffou is a realist; she is well aware of her strengths and those of her opponents. She is very modest with regards to her ambitions for the 2018 ITTF African Championships. Staged in Port Louis, Mauritius, the six day tournament commences on Monday 3rd September. A lawyer, Sarah Hanffou, the winner in 2010 on home soil in Yaoundé is one of the early arrivals in Port Louis. 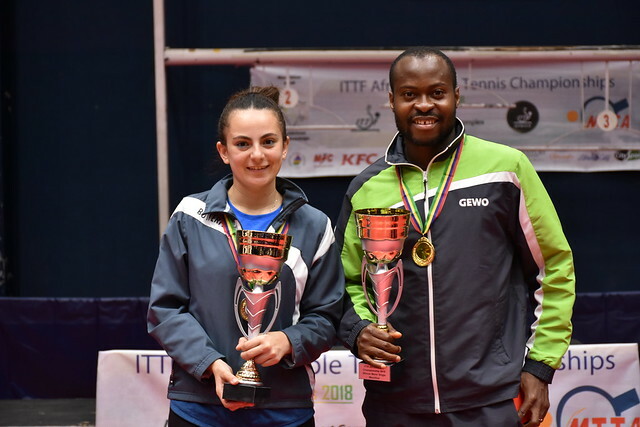 Currently, Sarah Hanffou, the runner up earlier this year in the first week of March at the 2018 ITTF-Africa Top 16 tournament staged in Nairobi, Kenya, has a full life, combining work, study and sport. Present some five days before proceedings commence, the question posed is as to whether the preparation will be sufficient to regain her title. Somewhat cautious in her assessment but reaching the final in Kenya suggests that she is major contender for a podium finish. Formerly a member of the French National Team; nowadays one her major roles is that of organising Ping Sans Frontières, an organisation that focuses on the humanitarian aspects of sport. Most certainly, through Ping Sans Frontières, Sarah Hanffou is willing to support by helping provide equipment for the Indian Ocean nation. “I want to enjoy myself while playing and go as far as possible. Furthermore, with Ping Sans Frontières and thanks to lots of players who are playing in Europe, we were able to bring more than a 100 kilogrammes of equipment. With Cédric Rouleau, who is a member of our team and one of our ambassadors, we will be happy to distribute the equipment to our partners but also to the national associations who are participating for the first time in the African Championship. We must join forces, help each other and give back what table tennis has given us.” Sarah Hanffou. A challenge awaits Sarah Hanffou and it is more than one challenge; not only playing but promoting table tennis in a wide sphere.